The rhetoric surrounding the fate of the city’s lone protected bike lane continues. Following weeks of discussion and political wrangling, the city’s latest politicized transportation project will be studied again after two initial reports were found to be inconclusive by some leaders at City Hall. The debate is, perhaps not coincidentally, taking place while the city’s bike community is becoming more active regarding numbers of riders, group rides and political activism. At a recent meeting at Mercantile Library dozens crowded the venue to hear a panel discussion and engage in conversation about the current and future state of Cincinnati’s bike network. Organized by Queen City Bike and other area advocacy groups, the event served as an opportunity for people to constructively discuss the good and bad about the city’s bike infrastructure. 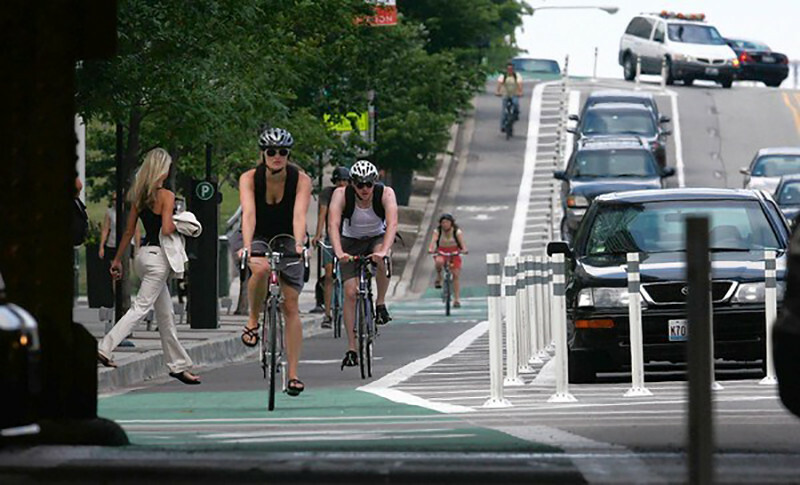 National studies have found that protected on-street bike lanes not only provide the greatest level of safety for both bicyclists and motorists but also encourage a greater range of demographics to bike. According to the American Journal of Public Health, this is largely attributable to the fact that streets with protected bike lanes saw 90% fewer cyclist injuries per mile than those without. Whether the future of Cincinnati’s bike infrastructure continues to focus on off-street bike trails or shifts to a more balanced approach is yet to be seen. The bicycling community is hoping to grow the number of people advocating for a more robust bike network but also refine the vision based on what it is the community wants to see pursued.